Sammy. Sweet Sammy has died. His parents haven’t “lost” a child. They would never…could never…be so careless. We pass a driving test or a kidney stone. We don’t just pass through life. Sammy didn’t just pass through life. 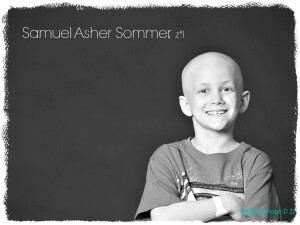 And at 12:33am, in the still solitude and with his beloved parents surrounding him with their love, Samuel Asher died. And on Monday, December 16, 2013, all Israel will gather together and lament him. Funeral services will be held at Am Shalom, Glencoe, IL at 1:00pm. Tenderly, we will return his body to the earth and tuck him in for his eternal rest following the service at Shalom Memorial Park in Arlington Heights. Shiva will be observed in The Crown Room at Am Shalom: Monday through Wednesday, 5-8:00pm, with a minyan service each night at 7:00pm. We will not celebrate; we will mourn. Together. As we always have. He is not in a better place because how could there be any place better than in his parents’ embrace? And God didn’t want Sammy with Him; God weeps with us in our time of sorrow. Blessed is the Eternal Judge of Truth. As a dear friend of the entire Sommer family, I thank you for your beautiful words. Thank you for these amazing and kind words. You said what we are all thinking but can’t put into words. If it were really a better place, why would anyone want to live? And it wasn’t time! May your memories be a comfort and a blessing. Your family’s love has touched many you don’t know, including me. Thank you for sharing your beautiful love and putting into words that which the heart can hardly utter. Thank you for this. Your words, beautifully composed, are a comfort amidst the unmoored confusion of processing these moments. Thank you for who you are for the family, and as a guide for our lamentations. Thank you for expressing so eloquently what we feel. My deepest sympathy to the entire Sommer family. My heart breaks for all of you. There are no words. Baruch Dayan Emet. I will keep your family in my prayers, I am so very sorry to hear this. This makes me proud to be a Jew. Thanks for your beautiful words. May Samuel feel no more pain and his dear parents begin to heal. I am a father and a grandfather. I have been surviving cancer for eight years. By age alone I am nearer to death than to birth. You and Sammy have shown me how to grasp life, embrace it, revel in it and, when the time comes, release it. I am grateful that you shared Sammy’s life with so many of us, unknown to you, but connected somehow through a friend of a colleague. Your expressions of love, of hope of disappointment and now of grief are a model for us all. May you find comfort in Sammy’s memory and in the warm words and deeds of those around you and on this thread. Our family is so sorry. My family grieves with you. We are so sorry for your loss. there are no words for this depth of grieving, this anguish. I am so deeply sorry. Such a sad day, December 14. Your message is as beautiful and tender as Sammy’s life was. May his soul be sheltered under the wings of the Shekhina and may Phyllis, Michael and everyone who loved Sammy know comfort and peace. I do not know the Sommers family personally but through friends. I woke up in the middle of the night thinking about Sammy and felt like something might have happened. It just goes to show how much he touched me and so many others. May his memory be for a blessing. Sending strength to his family and friends. I didn’t know this Sammy, but my Sammy and I sent a picture a little while ago, dressed up like Superman and offering strength and support… this news feels as painful as if he were a member of my own family. May you and Sammy’s family be comforted among the mourners of Zion and Jerusalem, and may Sammy’s memory always be a blessing. Sammy is in a better place in the loving arms of G-d. We should celebrate his Life and mourn his death. May The Lord bring healing as only He can to Sammy’s family. God is with His parents to mourn. What a wonderful boy and family who let so many of us into their lives at such a difficult time. so very sad and unfair. Rest in peace Sammy and to the Sommer Family may his memory be for a blessing. Followed a link here. Baruch Dayan Emet. It’s not supposed to be this way. I am thinking of you and your family. So, so, sad.. I have walked in the shoes you walk in now.. Please feel free to contact me if you so desire. So heartbreaking about superman Sam! My thought and prayers are with his family!! Thinking of you superman Sam!! DayByDay is an email support group for parents who have lost a child to cancer, or whose child is in hospice care for cancer. Please send an e-mail to Peg Rousar-Thompson at gravewords@yahoo.com for more information. THIS GROUP IS AMAZING. I was a member for years after my son Danny lost his 6 week battle with acute myeloid leukemia. Though I haven’t been part of it for several years, I believe many of the ‘same’ parents I ‘met’ are still involved. It is a support group like none other. The Martens Family is so very sad to learn of Sammy’s death. We pray for his family and for all who mourn him. I learned of the illness that your son, Superman Sam, was fighting through my son, Rabbi Dan Treiser of TBI Clearwater. Words just can’t begin to express my sorrow when I learned of the struggle you were all going through and my heartfelt sadness when I learned of Sam’s passing today. Hold each other tightly. Cry on each other’s shoulders, and then muster all the strength you have to honor your son and your fierce love for each other. May God keep you strong. My heart aches for your family. Sending so much love and hugs. I pray for Gd to hold you in comfort at this difficult time. I first met Rabbi Phyllis Sommer when she was a Rabbinate candidate interviewing for the position at Temple Chai several years ago. I knew then her character was strong with determination & the strength to be a great leader. It’s going to be that strength now with all the people she’s met, friends and family who will help her not just over the next several days but for the future to cope with this grief. I have faced cancer too many times and have to face it again this past year with my husbands rare cancer. The Temple Beth Miriam family mourns with you in every way possible. Wish I could attend!! So long Superman Sam!! Miss you already little man!! I am devastated for you and the loss of your sweet Sammy. Our life cycle isn’t supposed to work this way. I hope you find comfort and healing in the outpouring of love for you, your family and Sammy. You are in my thoughts and you will continue to be. Our family gravestone (where two of our sons are buried) reads, “To live in the hearts of those we leave behind is not to die.” And in this way, Samuel shall live on. There are no words that are adequate to convey our sorrow. You are right when you say that we will not celebrate, that Sam is not in a better place, that a better place is with his parents. It is true that G-d weeps with you, as we weep with you, at this tragic turn in time. Your family, your friends, your congregation, and everyone else whose lives you make, and have made, unique by being a part…we all grieve with you. Now and always, for Sam. I am so sorry for your terrible loss of your gallant little boy. Through your words, he has touched so many who never met him. His name is already a blessing–may his memory be, as well. And then there was love that replaced the randomness and cruelty of this universe. Love and kindness and simple humanity. I am so incredibly sad to read this. May Sammy’s memory be a blessing to all who knew him. And may his family and friends eventually be able to find some comfort in their good memories. I am so sorry about the loss of your beautiful son. I have been so moved by your love and strength. May your son’s memory be a comfort and blessing. I am so sorry for your pain, heartache and suffering. I am praying for your comfort and peace. Sending you love, love and more love. Rebecca, thank you so much for preemptively dismissing all the terrible platitudes that people often disseminate after such tragedies as this one. It is refreshing (as much as anything can be at such a time) to read blunt truth expressing cold realities without the feeble attempts to paper over them with bad theology and euphemisms. Your directness was more poetically moving than any elaborate metaphors or other literary devices would be. I feel weak reading about Sammy’s death and thinking about the pain it has caused those who loved him, especially his parents. I wish them comfort in due time, following the necessary and heavy grief that is about to begin. I heard about Sammy’s cancer through my son Rabbi Jonathan Siger ( CJCN Spring Texas). I have followed your family ‘s blog during this terrible time . As a mother & grandmother, my heart aches as I read of Sammy’s death. Please accept my deepest, heartfelt sympathy. Sammy’s name WILL be an eternal blessing . My heart goes out to Sammy’s parents, siblings, family, and friends. Like many others, I have followed the family blog, hoping and praying for a miracle. May his memory be for a blessing. May Sam live on through memories and heartfelt testimonies….may his parents experience a sense of comfort through friends, family and of course, through God the Father. Do not be afraid to share your memories, or your thoughts of Sam in times to come….when you think you “don’t want to bring it up” because you might “make his parents sad”. Remembering Sam will make them happy….remembering Sam will let them know that they are not alone in thinking of Sam…because they will, every day from now until the end of time…..
GOD BLESS you Sam, and all those who love you….your story has brought tears to my eyes and I will remember Superman Sam in spite of never knowing you…. I am heartbroken for you. Love, Hugs, and Peace. Our hearts go out to Sammy, his parents, his siblings, his entire family and all of their friends. Although we do not know you personally, we cry with you. HaMakom yenacheim eschem b’soch sh’ar aveili tzion v’Yerushalayim. May Hashem comfort you among the mourners of Zion and Yerushalayim. May Sammy’s memory be for a blessing. Very sad to hear this. Thoughts and prayers going out to his family. My heart goes out to Sam’s family and Sam’s family friends — you among them — for this immeasurable loss. May Hashem comfort you all in this very sad time. Baruch dayan haemet. I am so sorry. Please accept my deepest sympathies, and may his memory be for a blessing. Thank you for sharing a little bit of Sam’s soul with everyone who was privileged to read about him. I do not know this family, but this found it’s way to my FB page. I am deeply moved and mourn with you. From Maale Adumim, Israel. they don’t know what to say, and they just don’t get it. those in painful grief who will feel your love and support. Sammy will surely never be forgotten. My heart is hurting for all of you. I am so very sorry that your precious boy is dead. So sorry for your tragic loss. May your love and strength help you. We will mourn for him here in Israel. May you know no more sorrow. My heart is broken for your family. Sweet Sammy experienced overflowing love which some never do! I live far from you in miles but not in thoughts. Your words and love have touched so many……we all mourn with you. Beautifully written words for a beautiful child. Thoughts, love, and prayers your way. My heart goes out to Sam’s entire family. I was walking into a funeral yesterday for a dear friend of mine’s brother, Michael Madock, when I received the news about Sammy. My heart was already heavy with grief but the news of Sammy made the day that much somber. Michael Madock was 57 and died of the exact illness as Sammy. Although Michael was still young in the scheme of life, we spent the day celebrating his life. For Sammy, as you said, we will spend the time mourning. May Michael and Sammy meet up and give each other strength as they both were strong and incredible people that will always be an inspiration to me. I am so very sorry for your loss. I did not know you but we have mutual friends! I am so sorry for your loss, know that Sam will always be in your hearts! On behalf of the North Shore Post 29, Jewish War Veterans of the United States of America, we extend our most heartfelt sympathy to the Sommer family. May Sammy’s life serve as a blssing and an inspiration for all. We send our condolences to your family. There is nothing sadder than losing a child, and my heart goes out to you all. So true. There’s nowhere better for a child than in their parents’ arms. I’ve been crying abs crying. I don’t know your family personally but no Sammy touched so many lives. It’s not fair he is gone. I hope you find peace. Your posts are beautiful and touching. I’m thinking if your family Phyllis. How lucky to have had an incredible beautiful son like Sam. How lucky he has such amazing parents. Baruch Dayan ha emet. Rabbi Schorr’s words say it so well. Our hearts are heavy. We mourn with you. We feel profound sadness, but we will never truly be able to feel your pain. May the love that surrounds you and your entire family give you strength. We are so very sad to learn of Sam’s passing. Even though we never met him or your family. Even though it’s small, somehow we felt we knew him. You and your family touched us and we are deep with sorrow to learn of his death. כאשר שמע לבבות, המלאכים שרים. נשמה גדולה מגישה כולם כל הזמן. נשמה גדולה לעולם לא מת. זה מפגיש אותנו שוב ושוב. May The Lord God bless you and keep you, may his face shine upon you and give you peace. Know that your loss is felt by many and deepest sympathy sent across miles. Thank you for sharing your profound sadness with the world. There are no words to describe my profound sadness. Though I never met Sam I will never forget him. What a brave soul. This sweet boy has touched the lives of so many. He’ll probably never know it but his story — like the memories his family cherishes — will live on. I learned about SuperManSam last week via an article in the Trib. I then read your blog cover to cover. While I do not know your family, I want to say THANK YOU. Thank you for sharing the good, the bad, the ugly and all that greatness that encompasses SuperManSam! Your story and the light of SuperManSam inspires strangers like me in more ways than you will ever know. I am so sorry for your loss.I am not Jewish but we have the same beliefs about te condition of the dead. One thing left out in the words about was hope and I thought you might enjoy these scriptures. One where Job was praying for death where he would be safe until God remembered him :(Job 14:13-15) . . .O that in She′ol you would conceal me, That you would keep me secret until your anger turns back, That you would set a time limit for me and remember me! 14 If an able-bodied man dies can he live again? All the days of my compulsory service I shall wait, Until my relief comes. 15 You will call, and I myself shall answer you. For the work of your hands you will have a yearning. . .
(1 Samuel 2:6) . . .Jehovah is a Killer and a Preserver of life, A Bringer down to She′ol, and He brings up. Little Sammy has died but the God of the bible has not left you without hope for a great future, in a world with true peace earthwide and without tears and pan and sickness. These thoughts comfort me when I remember my 10 year old niece who has died and I hope they bring you comfort too. Like Job they are waiting for Gods longing of the work of his own hands when he will bring up those in his memory. I had been hoping against hope. I’m so sorry for your loss. May his memory be for a blessing. One day I saw a post about Sam from a mutual friend Rebecca. I have a son named Sam, so it caught my attention. I continued to read the posts about Sam’s story on facebook, and was so incredibly saddened by his story. But, at the same time, I was enveloped in his strength and touched by his courage. There is a special reason why G-d sent this young boy Sam to earth. Maybe it’s for us to learn how very precious life is, and how we should all enjoy every single day that we are given. Every day is a gift. Every day is special. And, every day we will cherish the lesson learned by this little boy who touched the hearts of people that he didn’t even know. We send our prayers to his close friends and family. May Sam’s sweet soul carry us through difficult time like this. Beautiful & thank you for sharing honestly what most of us are feeling & to remind us we have permission to mourn, be angry, shed tears for the beautiful boy that was taken from this loving family. You’re right – he was not lost but stolen away from this life by a terrible disease. And Sammy, his family, friends, medical team fought the monster with a courage & strength that is breathtaking. I’ve never met them, but will always be in awe of them & will never forget their Samuel. I am just so sad to hear of Sammy’s death. Like thousands of others here, I was hoping for a cure. I followed the story of dear Super Man Sam early on. You all are in my prayers and my thoughts. May Samuel’s memory be blessed. As the mom of a son who was taken from us too soon, our family understands the unnatural grief that accompanies the death of a child. Although we are not with you physically, we are with you in spirit on this journey. You do not know me. I have seen a few of your blog posts from FB friends. I just wanted to say – love to you. I am praying for you and your family. I cannot imagine what you must be going through and so will not attempt to comment or make you feel better. Just know that even strangers 1000’s of miles away are sharing your grief. And your willingness to share has provided my children with extended additional hugs these past few weeks. Bless you for the reminder to do so. Sometimes God brings these little flowers of joy into our lives but always lets us know how much we don’t control. We always feel we are in control but we’re not. God has a place for all us. We are merely passengers on a long and sometimes short voyage. What joys and sorrows we may have along the way we offer up to God. God never gives us more than we can handle in this short life. Samuel was your joy and sorrow. He will always be in your hearts. He will always be with you in spirit. May God give you comfort and strength at this time and heal your pain. Prayers for the family and friends of a new beautiful angel. You don’t know me and I don’t know you, Sommer family, but my heart is aching for your pain at this saddest of times. You are in my prayers for comfort as you mourn the loss of your sweet son, Samuel. His life may have been much too short, but he must have fulfilled his purpose very quickly, even if it was only to teach you about loving and letting go. This mother, grandmother and great-grandmother in California is sending you love today. I’m very sorry. Although I didn’t know Sammy, and have only met Phyllis once very briefly, our congregation had been saying a Mi Sheberach for Sammy for many months, and I had kept him in mind and heart every night his name was mentioned. I’m very sorry that he passed away, and offer my condolences to his family. Thank you for such an eloquent heartfelt statement. To the Sommer family I offer my condolences and pray for comfort and healing for you all. May Sammy’s memory continue to be a blessing. The entire Sommer Family is in our thoughts and prayers as our family mourns along with you at this profoundly tragic time. You are in my thoughts and prayers. Sammy was a beautiful person, and you are a strong, amazing family. I am pray for your healing and peace, and may Sammy’s memory be a blessing. Condolences from Jerusalem. This is so sad. We can’t EVEN begin to imagine or think we know how deep your loss is…..Superman Sam is SUPERHERO!! He is blessed to be loved by all of you! We have walked with you…through your eloquent words…from the beginning…and will be walking with you today. Thank you for sharing Superman Sam and your family with us. You will forever be in our hearts. I lit a candle before Mass yesterday morning for Sam. I am in awe of this family’s devotion to one another and boundless love for the incredible child, Sam. I am so deeply sorrowful for his untimely death and will keep the Sommer family in my prayers. God bless everyone who loved Superman Sam. I am deeply touched. Not knowing Sam but hearing a bit tonight from a family friend of his, I shed a tear and say a prayer. May god bless. I only became aware of Sam’s death and the struggle he has had over these past months. He was a little boy much loved and he will be greatly missed. Such a short earthly life but filled with love and laughter. May the God of comfort and strength be there in abundance for you all, and may the memories of Sam be sweet. No words, no tears can silence the stab of pain resulting from reading the beautiful elegy by Rebecca Schorr. There is no other pain like the pain of losing a treasured child. My deepest sympathy to his family who have suffered along with him. We are so sorry for your loss. May his memory be a blessing. I do not know if you remember me, I am Jenni Ramsell’s mom. I was so saddened by your loss. I just wanted to tell you, I am thinking of you during your sorrow and pain. I will keep all of you in my prayers. Next post: Business or Pleasure?